There are plenty of interesting things to do in Tokyo and it is best to spend at least one full week to fully appreciate the city. It’s my second time in Japan but my first time in Tokyo. I was expecting a concrete urban jungle but to my surprise, Tokyo offered an experience beyond a typical Asian city break! A futuristic city yet people remain to be closely grounded on cultural and social values. A place where modernity and authentic local culture remain to co-exist. A city where skyscrapers, massive public parks, temples and traditional kabuki theaters sit side by side. Such kind of harmonious contrast can hardly be found elsewhere these days making Tokyo a very fascinating place to visit! I really like Tokyo and it is a city worth a repeat stay. I love the vibrant Japanese culture, the friendly people and the great natural sceneries within Tokyo and its nearby suburbs. So now, I’m sharing my top 10 favorite things to do in Tokyo in this Tokyo travel blog to help you plan your visit! Related reading: Tokyo Itinerary 7 Days – learn how much you should budget for your Tokyo trip, where to stay and how to get around. 1. Enjoy the beauty of Tokyo’s massive public parks. Massive public parks are pretty rare in highly urbanized Asian cities but not in Tokyo. Stroll along the massive grounds of Ueno Park, Yoyogi Park, Shinjuku Gyoen or East Gardens of Imperial Palace. Enjoy the beautiful cherry blossoms during spring time! Each park has its own character making each one a unique place to visit. I personally love Shinjuku Gyoen and East Gardens for their serenity and vast grounds for picnic. Simply perfect for quality time with family. 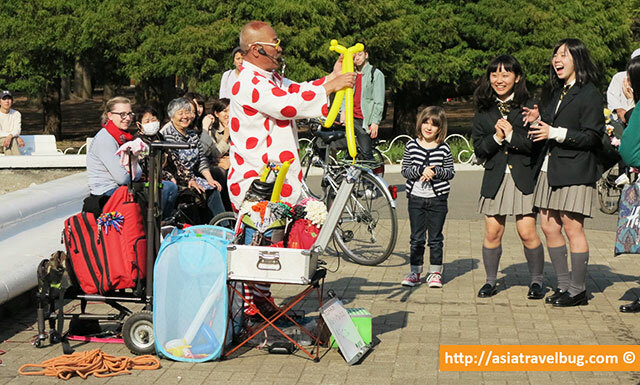 If you wish to see street performers or teens in interesting bizarre outfits, drop by Yoyogi Park in Harajuku. If you want to have an experience in between the youthful vibe of Yoyogi Park and peacefulness of Shinjuku Gyoen, Ueno Park is for you. Cost of the Experience: Free to enter Ueno Park, Yoyogi Park or East Gardens of Imperial Palace. Yen 200 (~USD 2) per adult to enter Shinjuku Gyoen. 2. Do what the locals do. As an avid independent traveler, nothing beats the experience of living like a local. I was lucky enough to be in Tokyo when the cherry blossoms were in full bloom and I took time to on a Sunday to have a hanami picnic in Shinjuku Gyoen. Eating sushi under a cherry blossom tree felt so surreal beyond words. The pink petal storms created by blowing winds added a touch of magical charm. I can still vividly remember a cute Japanese couple beside us carefully bringing out a portable gas range to warm their soup. 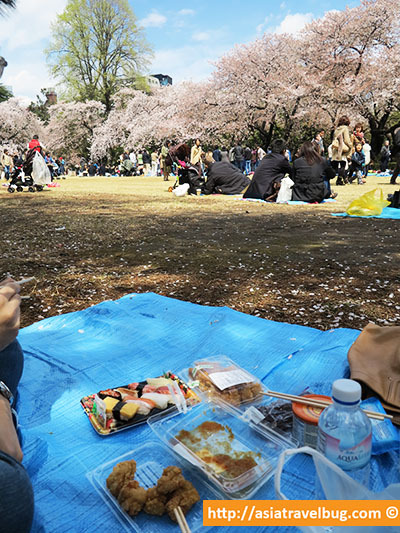 See, doing hanami picnic is also a perfect opportunity for people watching! This experience should be one of your top things to do in Tokyo! Cost of the Experience: Yen 200 (~USD 2) per adult to enter Shinjuku Gyoen. Approximately Yen 600 (~USD 6) for 8 pieces of sashimi from Family Mart. Yen 300 (~USD 3) for a reusable blue picnic mat from convenience store. 3. Get local travel insights from locals. I’m so glad to have stumbled across a FREE local service called “Travelers and Locals Japan.” The company matches English-speaking tourists with local Japanese who will be happy to guide you around Tokyo for a chance to practice English. I was quickly contacted by a local after I signed-up online and was able to get local insider tips on the best time and place to see cherry blossoms. We were accompanied by the Japanese local in Tsukiji Fish Market as we have agreed over email. I’m really happy to see a piece of Tokyo from a local’s perspective, we avoided tourist traps and I learned that wasabi is a vegetable. 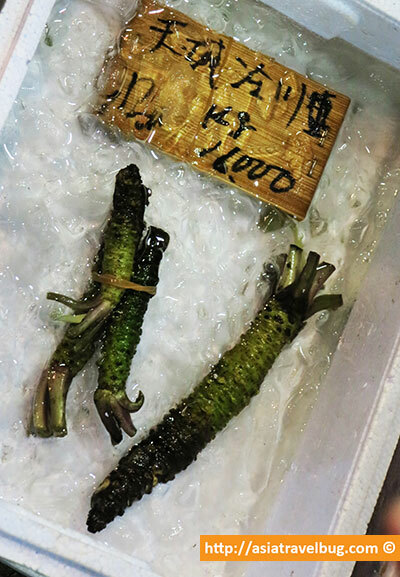 Without the Japanese local, this vegetable in the picture below could have easily passed as a shaved broccoli to me given that there are no English signs in Tsukiji Market. You can book for the free service here but make sure to sign-up at least 2 weeks in advance. This is something I would personally recommend to family and friends. Cost of the Experience: Free and no tips. Food, transportation and applicable entrance fees will be at your own expense. 4. Eat where the locals eat. Eating out in Tokyo is not as expensive as you think! 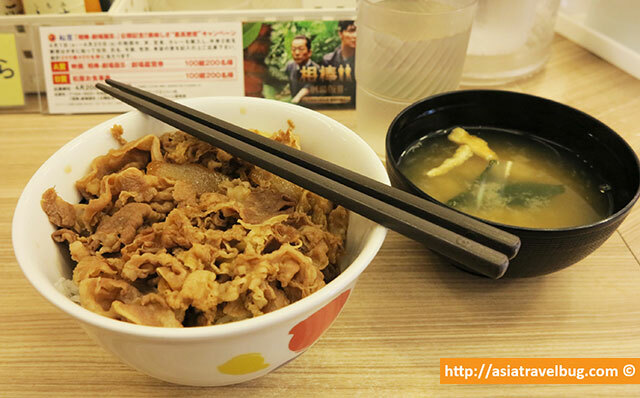 I can easily find good beef rice bowls for USD 4 in Matsuya (fast food), katsudon lunch sets for USD 7 in Hamakatsu (mid-range) and a really good ramen bowl in Ippudo (mid-range) for USD 8. Add approximately 20%-30% for dinners from lunch prices except for fast food. These restaurants have great food, fantastic service and are frequented by local salarymen. Plus there are no tips and no service charge! 5. Drop by Asakusa and have fun people-watching. 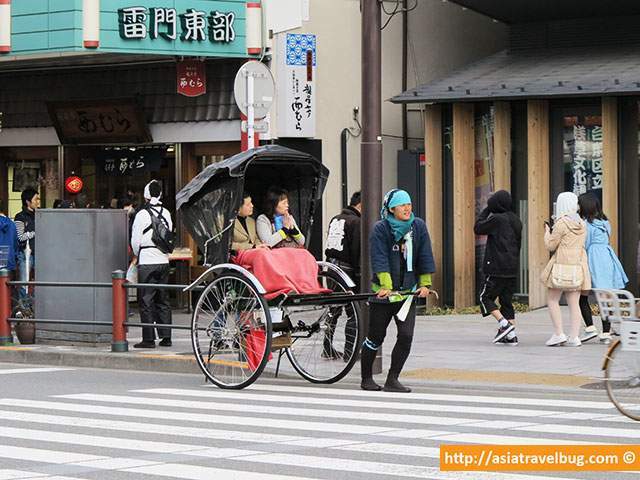 Located in the old part of Tokyo city, Asakusa exudes a rich cultural Japanese vibe. I call Asakusa a little slice of Kyoto in the heart of Tokyo. See interesting personalities in Sensoji temple, watch people riding in human-powered rickshaws and get a chance to see locals strolling the streets of Asakusa in their lovely kimonos. Your trip cannot be complete without crossing out Asakusa from your Things to Do in Tokyo bucket list! 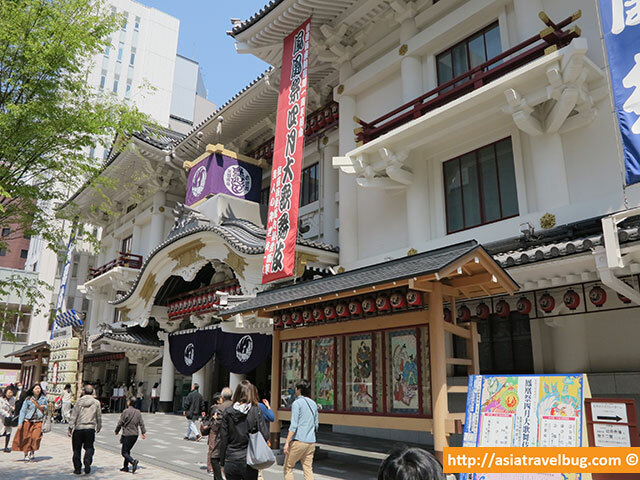 Cost of the Experience: Free, you just need to start off from Asakusa station. 6. Get lost in Shinjuku station. With 200 station exits in the world’s busiest station, I find it easier to navigate my way to Mt. Fuji than to find the right exit out of Shinjuku Station. But getting lost in Shinjuku Station is part of the fun. If you are lucky, you will be able to see interesting people just like this lady train commuter dressed a beautiful kimono. Lady Commuter in Shinjuku Station Dressed in a Lovely Kimono. Only in Japan. 7. 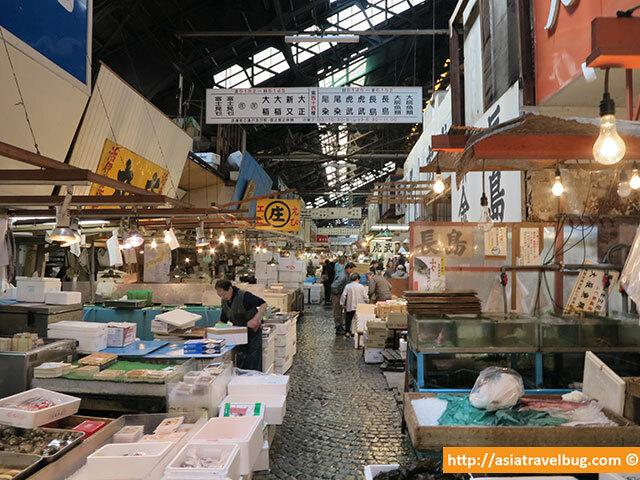 Visit Tsukiji Fish Market before it moves out of central Tokyo. Tsukiji Fish Market is actually an active wholesale trade market 5 minutes walk away from Ginza, one of the world’s most expensive plot of land. The famous fish market will be relocating to a suburb location within the next few years. So if you want to take a last look of the world’s largest fish market and enjoy fresh sushi in a convenient location, you have to visit now. Cost of the Experience: Free to tour on your own. 8. Make a quick day trip out of Tokyo to see Mount Fuji, but be sure to monitor the weather! It is true that no trip in Tokyo can be complete without a visit to Mount Fuji. I was lucky enough to see Mount Fuji from Gotemba on a rare cloudless day with cherry blossoms as bonus. Mount Fuji is such a real beauty, fascinating and marvelous. You have to see it for yourself. Weather permitting, the day trip to Mount Fuji should be among one of the things to do in Tokyo which you should not miss! Cost of the Experience: Free to enter Gotemba Peace Park (aka Heiwa Park) where this beautiful photo of Mount Fuji was shot. Roundtrip Odakyu bus fare from Shinjuku to Gotemba Bus Station is approximately 2900 yen (~USD 28.5). If the trip to Gotemba will be taken with Hakone Free Pass, fare top-up of bus to and from Gotemba Bus Station is 890 yen (~USD 8.75) per way. 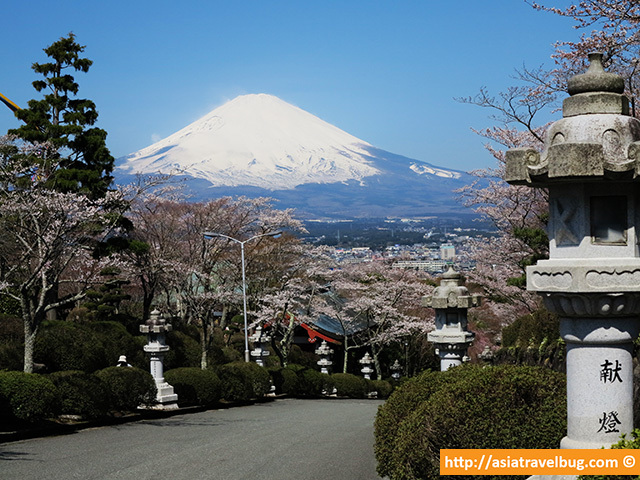 Related Reading: Click here to learn how, where and when to see Mount Fuji at its best. 9. Pay a visit to Meiji Shrine. If you can’t get enough of Tokyo’s massive public parks, visit Meiji Shrine in Shibuya. A forest with a Shinto Shrine occupying 175 acre of land in the heart of Tokyo. 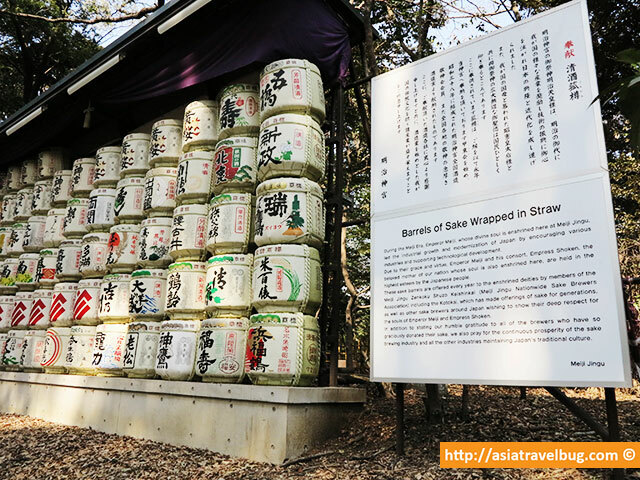 See colorful barrels of sake and wine lined up along the walkways. Stroll around and take deep breaths of fresh forest air! Cost of the Experience: Free to tour on your own, no entrance fee on the main grounds. 10. 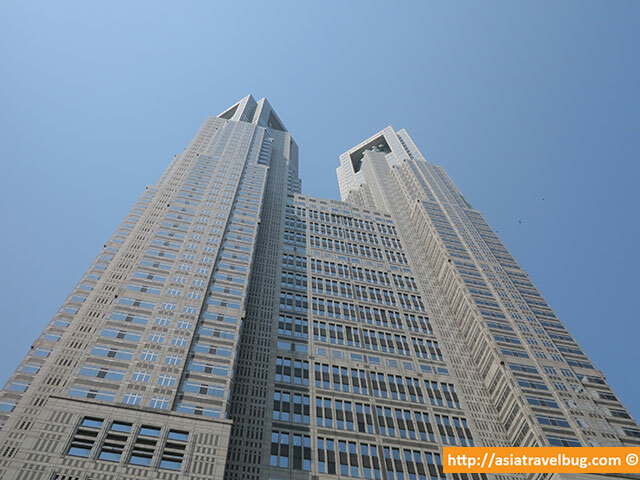 Get a free bird’s eye view of Tokyo from Tokyo Metropolitan Government Building in Shinjuku. You read it right, it’s free! There are very few queues to go up and see Tokyo skyline from above. On a very good day, you can even have the chance to see the tip of Mount Fuji from afar. Interested to see a more traditional Japan? Hop on the train and head to Kyoto. 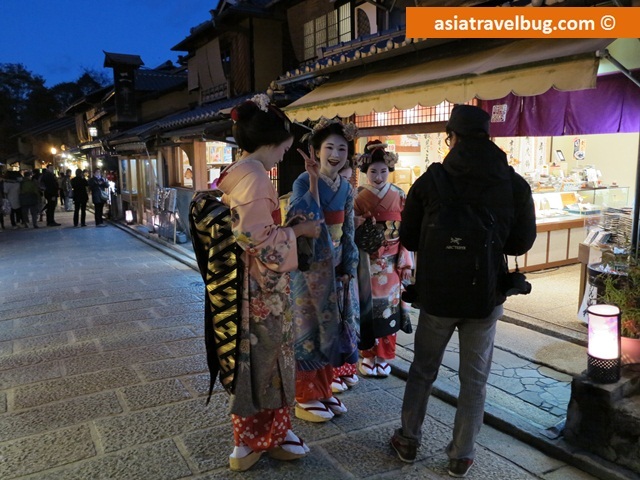 See real-life geishas in Higashiyama District. Stroll along charming alleys dotted with 100+ year old Japanese houses. Check out our Kyoto blog and have a blast from the past Japan travel experience! Unsure where to stay in Tokyo first time? No problem! We’ve done all the grunt research work for you! Check out the 7 best tourist districts in Tokyo in our Where to Stay in Tokyo First Time blog and save yourself weeks of research. Afraid to get lost in Japan? A pocket wifi can be your travel best friend. Asiatravelbug strongly suggests first time visitors to rent a pocket wifi. Check out 5 reasons why you need a Pocket Wifi Japan Rental in your trip to Tokyo. Free public WiFi is RARE in Japan! No Tokyo itinerary yet? No problem, we’ve done all the grunt research work for you! Check out Asiatravelbug’s Tokyo Itinerary travel blog. Looking for a convenient place to stay in Tokyo? Asiatravelbug suggests that you book with Agoda for best rates. Love this article? Share this with your friends or travel buddies using the social share buttons below! I will be going to Tokyo in early August with 5 senior 60s, are u able to help me what is the best way for me to view Mount Fuji n go premium outlet. I am confused about the hankone pass etc. I am staying in Shinjuku, I tried to minimise walking for the oldies. My cousin was in the same situation as yours with 3 senior citizens in their travel group. To minimize walking, they booked bus tours from Shinjuku similar to this and this. They came back all very happy and the seniors were not stressed by the day trip since there is a tour bus. Hope this helps. I wish your family a safe and happy trip to Tokyo! Hi, your blog has been very useful in planning my family trip this upcoming december. do you have a special itinery for 9 days this coming december holidays? I have small kids aged 5 and 7 with me. I would like to include hakone, mt fuji and Nikko if possible in my trip. Thank you for your kind words! Please feel free to refer to my 7 day Tokyo Itinerary and iterate it according to what your family wishes to do in Tokyo. Since my itinerary doesn’t include trip to Tokyo Disney and Nikko, you may wish to add these in your itinerary. I hope this helps and I wish you and your family a great trip to Tokyo! Your Tokyo articles are so informative! It helped me so much when I was planning my family trip! I have one question, Have you ever been to a ryokan? I was thinking of having a one night stay during my trip but I am having trouble deciding whether or not to book one or not! Currently we are going to stay at the Citidines Shinjuku hotel you recommended and my mom is very excited to go there! Thank you very much for your kind words. Staying in a Japanese ryokan remains to be in my travel bucket list! Most of the good ryokans in Japan are in Kyoto and Hakone (near Mt. Fuji). If you are considering an overnight trip to see Mount Fuji from Tokyo, booking a ryokan in Hakone might be a very good cultural experience. There are a few ryokans in Tokyo and most are located in Asakusa area. For first time travelers to Tokyo, I suggest hotels over ryokans as hotels tend to be much more accessible to public mass transportation. I hope this helps. In case you decided to stay in a ryokan, let me know your experience! Wishing you and your mom a great trip to Tokyo! I’m sure you will be back. this post is good for people like me visiting Japan for the first time. Will be making a trip in mid Nov, for about 10 days with my bestie. Is Kyoto accessible from Tokyo? Starting point for us will be Tokyo! Just choosing the airport is a headache, there are 2 airports! Hello Yin! Yes, Kyoto is accessible from Tokyo. The fastest way is via Shinkansen bullet train. If you are on a budget, you can opt for a bus but it will be overnight and a long journey. For Tokyo, I suggest you to choose Haneda Airport instead of Narita as your point of entry. Haneda is very near Tokyo city center so you save time and money from airport transfers. Hi Tiffy! I’ve been reading your Japan-tagged posts and truly appreciate getting first hand information and insights since my family will be travelling to Japan for the first time this April. As we’re doing Tokyo-Kyoto-Osaka (flying in via HND and exiting via KIX; Stay Tokyo for 6 days then we’ll be in Osaka for the next 7), I still couldn’t figure whether getting the JR pass will be worthwhile. Am I on the right track if we just get one-way Nozomi passes from Tokyo to Osaka then just buy local passes for both Tokyo and Osaka? I just based my it from using Hyperdia. Will greatly appreciate your input. Thanks in advance! Thanks for your message and I hope you are doing well! The 7 day JR pass could be convenient and of great value if you will be doing a round trip shinkansen ride between Tokyo and Osaka. Since you are on an open jaw ticket (flying in HND, departing KIX), buying a 1 way shinkansen ride will turn out cheaper. You can use the local train line in Kansai region to transfer between Osaka, Kyoto and Nara for day trips. These areas are just within 1 hour local train radius from each other and you don’t need shinkansen to travel within and between Osaka, Kyoto and Nara. I hope this helps and I wish your family a happy spring trip to Japan! P.S. Don’t forget to book a pocket wifi so you can access hyperdia and google maps on the go. For some weird reason, it is not possible to download offline Japan Google Maps. I highly recommend Pupuru pocket wifi and you can book yours here. April is super peak season in Japan and pocket wifi rentals sell like hot cakes. I suggest you to book your pocket wifi as early as you can. Thank you for the tip, Tiffy! Looks like we’ll be doing just that- buy 1-way Shinkansen tickets and just use the Pasmo/Suica or Icoca cards for the local/regional trains. Also followed your blog tip re PuPuru. We’re picking up the unit at HND. For 13 days, we got it for about 18,300JPY ([au] Wi-Fi WALKER LTE unit). Thank you for sharing all these wonderful tips on Japan. I’m rereading everything again today and clipping notes for reference. That’s good to hear Aimee! I wish you a very wonderful spring trip to Japan! It’s a great time to be in Japan this week for cherry blossoms. Don’t forget to do hanami picnic! Thanks so much for this. Love this blog. going there this April and really helps me out! i did “#6. 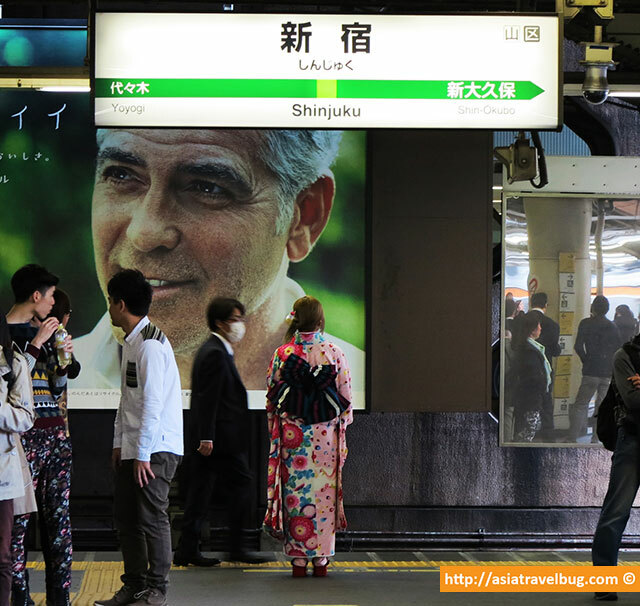 Get lost in Shinjuku station” on day 1, 2, 3, 4 and 5.